(1) Shell House formerly known as the The Asiatic Petroleum Company Limited (APC) building 24-32 Queen's Road Central, facing Pedder Street. where Chan had registered two trading Companies, Wah Kee Hong and Wing Kee Hong with offices on the second floor. They were the cover for the General Party Branch of the Kuomintang and the ROC. Chan Chak had been voted head of both in June 1941. 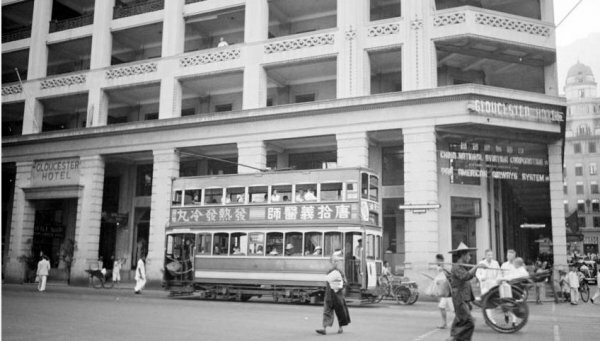 (3) The China building behind which was the Pedder Building in which Chan Chak had his private office on the 4th floor. 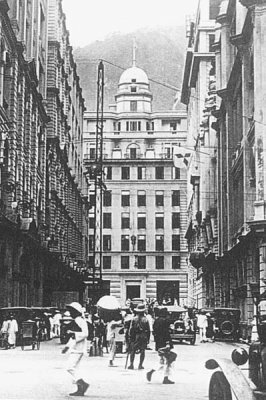 The Gloucester Building on the corner of Des Voeux Road and Pedder Street where David MacDougall & Ted Ross had set up office on the third floor. 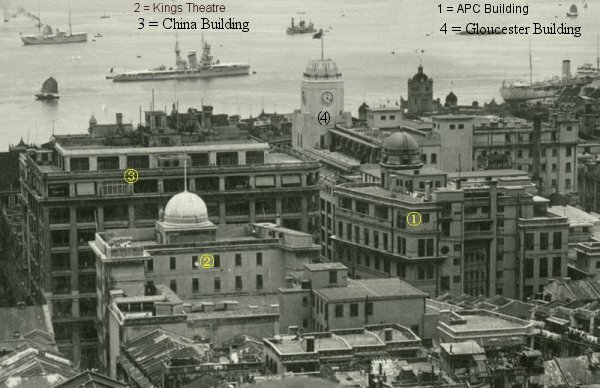 Adm Chan Chak had a private office with accomodation on the 4th floor of the Pedder building at the top of Pedder Stree on the rightt. Phase one of the escape started when Robinson, Oxford, MacDougall and Ross went up the road to the Pedder building to see if Chan and his party were ready to go. Up in Chan's private office on the 4th floor overlooking the road they were joined by two more staffies, Guest and Macmillan. Chan was on the phone to Sir Mark Young the Governor and C-in-C. Colonial Secretary Frank Gimson arrived confirming the surrender and told them they could go. Just after 15.30 they came down down the external stairs and Henry dashed round the back where he had a soft topped Austin ready in the car compound. Ted Ross had his Buick just over the road parked outside the Kings theatre in Queens Road. They pulled away at 15.45, Ted driving the Brishers and Henry the Chinese. As they sped off westwards down a deserted Queens Road they saw Two-Gun Cohen and pulled up, he poked his head in to enquire what they were up to, and, after being invited to join them, declined and just sauntered off up the road to take his chance with the Japanese. On they drove, past the Queen Mary Hospital arriving in Aberdeen by Staunton Creek at 16:15. Left: The Gloucester Building on the corner of Des Voeux Road & Pedder Street. Near the top on the right is the Pedder Building where Chan had his private office & sleeping quarters on the 4th floor. British Colonial Laws forbade Native Chinese to occupy a European hotel. Top is the APC building in Queens Road Central from Pedder Street where Chan's registered office was.